Get your kids in the kitchen for some creative fun making delicious treats! In autumn, mushrooms and toadstools begin to appear in the woods and in other damp, dark locations. There are over 10,000 species of mushroom and more than 30 of them can glow in the dark! Many of the mushrooms your children are likely to have seen are white or brown with smooth caps. Our toadstool recipes focus on the more iconic style of mushroom with a red cap and white stalk. It's a fun and easy recipe to follow, and a great activity that you and your family can do together. Show and teach your kids about colours and colour intensity while you colour the frosting. 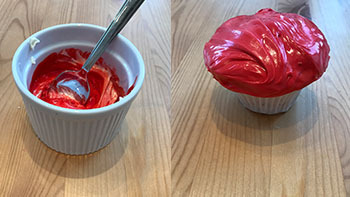 Mix a few drops of red food colouring into the white frosting. Stir well to combine the colour. Ice the cupcakes with the red frosting. This will give the mushroom hat a brilliant red colour with a rough surface, very different to the smooth, white hat of button mushrooms your kids might have seen before. Use your fingers to flatten the marshmallows out, so that they look like circles. 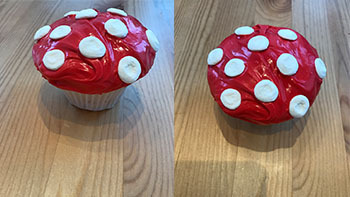 Place the mini marshmallows on the red frosting to complete your toadstool cupcake! In nature, when something is red it usually means that it is toxic or poisonous. Some toadstools have evolved to have bright red, warty surfaces which warn humans and other animals that they are not good to eat. Not all toadstools are poisonous, but because it is very difficult to tell the difference between those that are edible and those that aren't it is always better to leave mushroom foraging to the experts. If the last recipe screams sugar overload, you'll be happy to know we've come up with an alternative that, while just as delicious, will also get your kids eating some fruit. 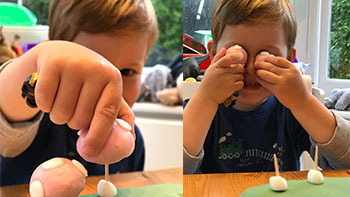 But we must warn you that this recipe does include some sugar, and please don't blame us if your kids demand mini marshmallows every time they have raspberries in the future! Cut circles out of the fondant that are bigger than the cupcake and cover the cupcakes with the fondant. Poke one end of a toothpick into a mini marshmallow and push the other end into the cupcake. 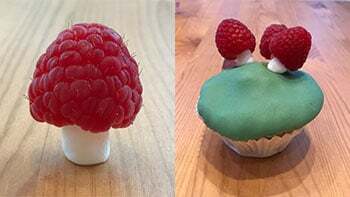 Place a raspberry on top of the marshmallow and make a toadstool. Decorate each cupcake with as many toadstools as you like. 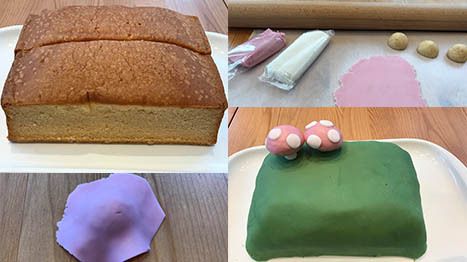 If you need to feed more hungry cake-lovers, you may want to think about baking a big Toadstool Cake rather than individual Toadstool Cupcakes. This will also allow you to feed the kids smaller portions as we all know our kids too well: if they see a cupcake, they want one. And they want a whole one - no matter how big it is! Use the green food colouring to colour enough of the white fondant to cover the large base cake. If you're having trouble getting the fondant to stick to the cake, apply a thin layer of water icing to the cake first. Decorate your cake with as many toadstools as you like! Happy Baking! And don't forget to send us photos of your amazing toadstool cupcake and cake creations!